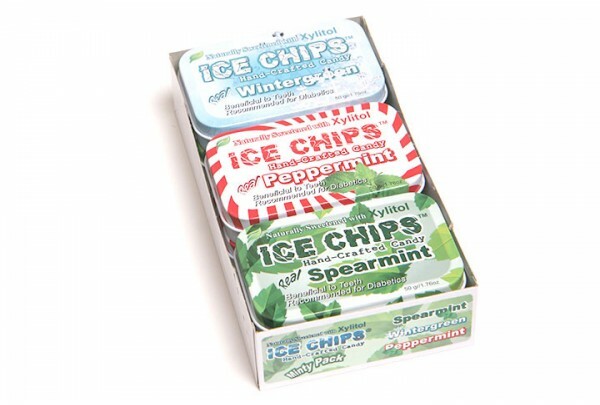 Peppermint Ice Chips® take the ho-hum flavor of mint and shoot it into the stratosphere. Experience authentic peppermint taste for the first time in ages. Wintergreen Ice Chips® are practically a fifth season! Cool, minty, strong and wintery, they blow through your taste buds and leave you breathless. Enjoy Ice Chips® throughout your day to keep breath fresh, and teeth healthier! Allow Ice Chips® to dissolve slowly in mouth, coating teeth. Dentists recommend four to eight servings a day to receive full oral health benefits of Xylitol (made in the USA).